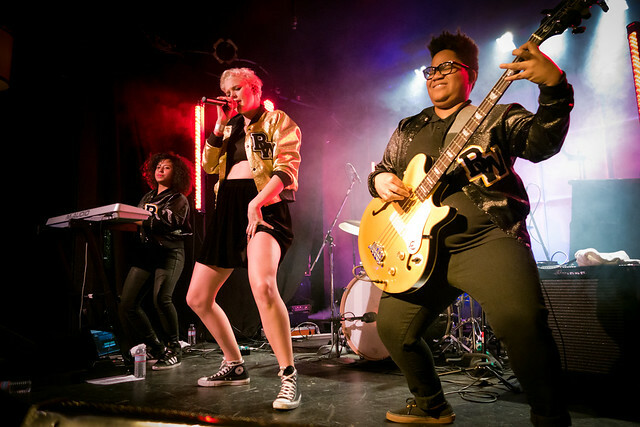 Betty Who (Lauren Fuller, Jessica Anne Newham & Jemila Dunham) performs her first ever Los Angeles show at The Echo. Jessica Anne Newham, better known as Betty Who, has been the talk of the music scene since she released her debut EP The Movement last year. And because of that EP, she's made a lot of those 'artists to watch in 2014' lists. Her name just kept popping up everywhere - blogs (Idolator) , websites (MTV), magazines (Elle, New York Magazine) a couple getting engaged on YouTube, etc... In fact, one of those lists actually came from the music taste maker magazine Time who listed Betty Who as one of the "Acts to Watch in 2014." Aside from the YouTube engagement video that went viral, I hadn't heard any of her other songs until last week. Betty Who sings to a fan at The Echo on Jan. 21st. The Australian native who studied on the east coast, played her first ever gig in Los Angeles, selling out The Echo in Silverlake. You couldn't take your eyes off her as she echoed the pop-explosion sounds of the 80s with sparklets of R&B. Her songs, like herself was like watching a fireworks display and ooh-ing and ahhh-ing with each bursts of colorful melodies, watching the sparks shoot out every which way, marveling at trail of light fading softly away. Betty Who will perform at SXSW this March. 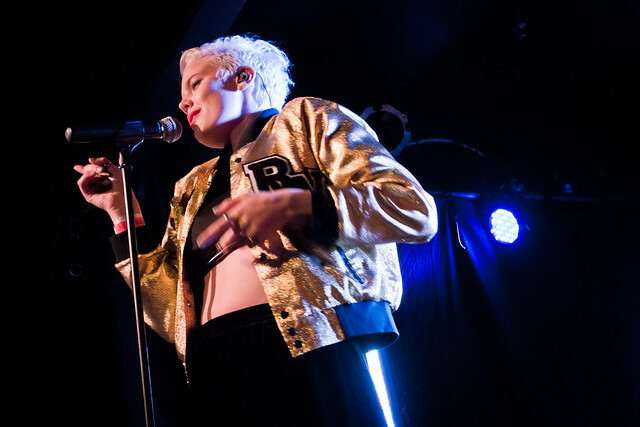 Performing every song off her smash hit EP The Movement (there's only four songs), Betty Who treated the packed crowd with some new tunes like the tender, romantic-pop ballad "Alone Again" and the sure to be her next hit song "Giving Me Away." But one of the highlights of the night was when she invited actors Glee's Kevin McHale and Telly Kousakis up onstage as backup dancers during her rendition of The Spice Girls' "Say You'll Be There." She ended the night with "Somebody to Love" to a dancing crowd that definitely didn't want the night to end. Betty Who knows how to put on a show or a party for that matter. This week, Betty Who just announced a new string of North American tour dates beginning March 22nd in Philadelphia and then making her way through Los Angeles, Chicago, Boston and finishing off in New York. She also is scheduled to perform at this years' SXSW in early March.